With all of the great music and artists they had to work with, the producers of “BABY, IT’S YOU” seem to have blown it. I can’t give you a first hand report, since some “bloggers” weren’t considered important enough to be given tickets to the show, but here is the New York Times review. “Mama said there’ll be shows like this. But she didn’t tell me there would be quite so many, or that any one of them could be this dismal. 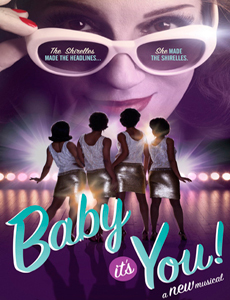 If you recognize the lyrical allusion in that first sentence, you may have guessed that my subject today is “Baby It’s You!” the new Broadway musical about the pioneering girl group the Shirelles, which opened Wednesday night at the Broadhurst Theater. If you do not recognize the allusion, you may now be wondering if the world was crying out for a Broadway musical about the pioneering girl group the Shirelles. The answer is probably not, but Broadway has increasingly become a booming marketplace for boomer nostalgia, a national resource that could solve our energy problems in a trice if it could somehow be converted into kilowatts. Even though I was signed to Scepter Records I got a salary, for writing and producing the Shirelles, The Guess Who, and The Kingsmen, I never received one penny in royalties. I’m sorry to hear that Florence Greenberg, who once loomed so large in our industry, has been given such a poor tribute.